The DPH04 driver owns 4 Peak and Hold command channels. It is designed to drive low impedance devices like low impedance injectors. It can also drive several identical devices per channel (for example to drive 4x2 injectors). This driver is not suitable for direct injection, because direct injection injectors need a high tension to open. For direct injection, see our driver DMg06. The Drivers DPH04 performs Peak & Hold commands. They are used to control low-impedance devices, such as for example some injectors or solenoid valves whose impedance is less than 5 Ohms, that would not stand a simple On-Off command (also called saturated command) because the current command is too high and destroys these devices or the devices that control them (for example the injectors outputs of an engine management ECU). It is allowed to connect in parallel several devices per driver command track, provided that these devices are identical. The setting of the DPH will then be adapted: multiply the power levels by the number of devices commanded on the same track. For example, if a device requires a 4 amps Peak level and a 1 amp Hold level, to command 2 devices in parallel on each channel, then tune the DPH on 8 amps Peak current and 2 amps Hold current. • Inputs commands by the ground, 1 KOhm pull-up resistor to +12V After Key integrated into the driver. 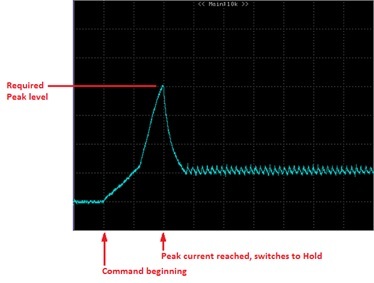 - the driver switches to the Hold as soon as the Peak current is reached. 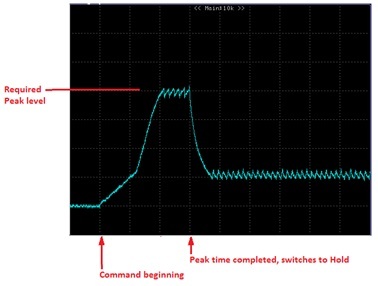 The Peak time is the maximum duration before the driver switches to Hold, in the case where the desired current is not reached. - the driver controls the current during all the Peak time then switches to the Hold. 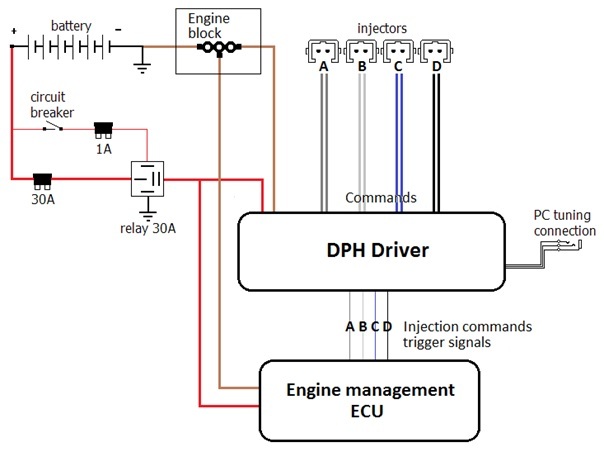 The factory setting provided in the driver fits to the needs of the majority of the low impedance injectors, with only one injector connected per command channel. 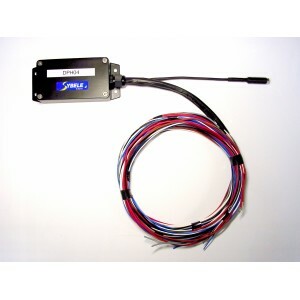 If this tuning fits with your injectors, you do not need the connection cable PC-driver FTDI. 1) The driver controls the current during all the Peak time then switches to the Hold. 2) The driver switches to the Hold as soon as the Peak current is reached (this is the normal way to command the low impedance injectors). The Peak time is the maximum duration before the driver switches to Hold, in the case where the desired current is not reached (for example if the battery tension is too low). The Hold maintains the opening of the injector without damaging it by an excessive rise of its coil temperature (lower level of current). The connection kit is to be separately purchased. It is essential to be able to connect your PC to the DPH04 Driver if you desire tunings different from the factory settings. The USB-FTDI interface is the same one than for Challenger5 and Challenger6 ECUs. You can download the DPH04 tuning software from the Skynam website.